I wanted to point out some tools of the new website that should help readers. 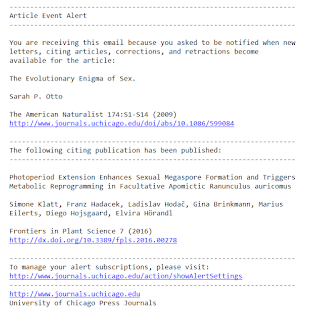 They can only be accessed after logging in, and, since most people access the website via an institutional subscription or with an open access article, they might not realize that these tools for keeping an eye on Am Nat exist. The Log In link is on the top of the page. This takes you to the log in page for Customer Service. 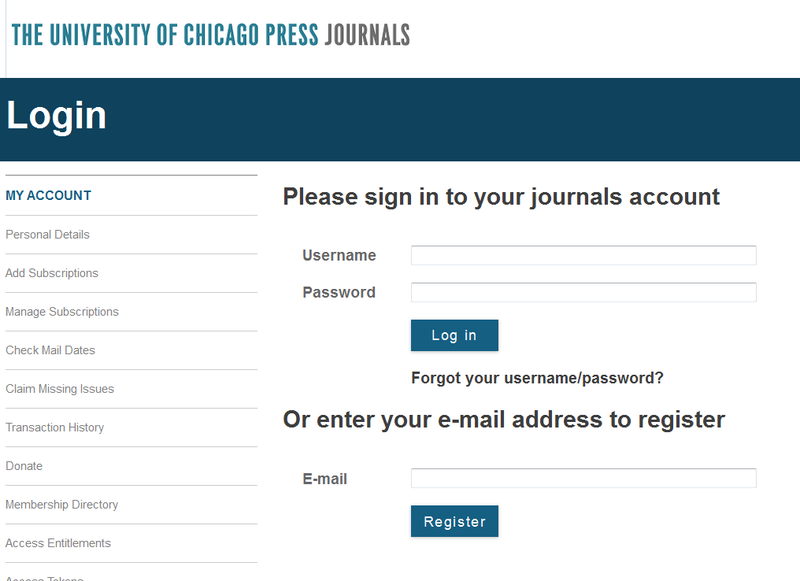 If you are a member/subscribe, you should use your subscriber information for the top log in where it asks for username and password. You don't need a subscription to set up an account to access the tools. 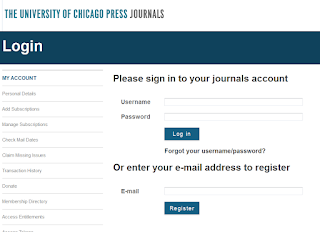 Type in an email address into the bottom form. 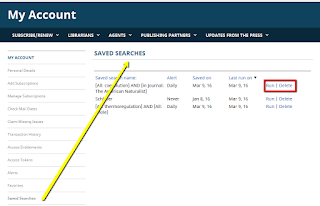 It will let you know if you already have an account—if for instance you are already getting the email with the Table of Contents each month. It asks for a minimal amount of basic information. Once in, it tells you whether you have a subscription or not. 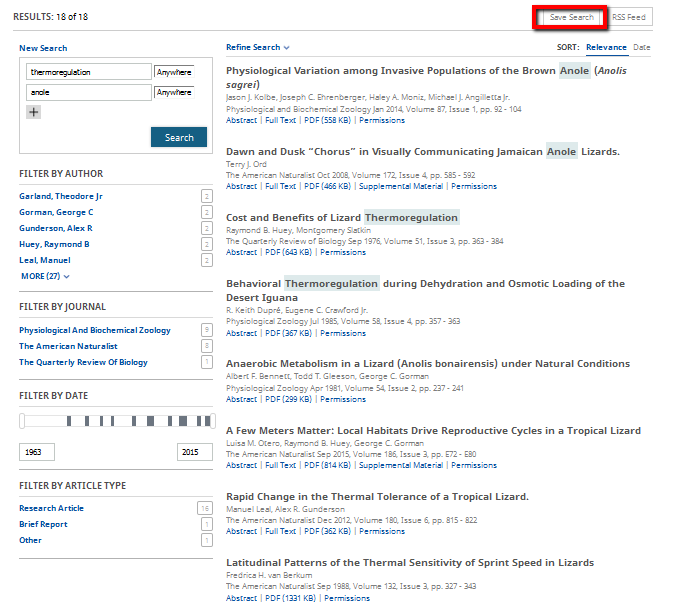 The features that you can use are at the bottom of the menu on the left. 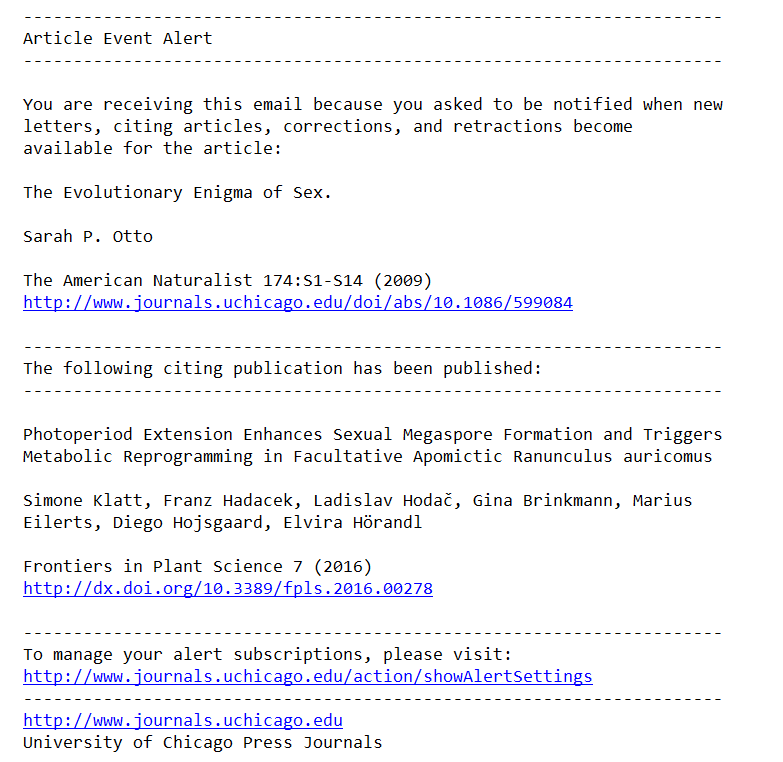 The Alerts Link allows you to set up an email that sends the Table of Contents each month when the issue as a whole posts. 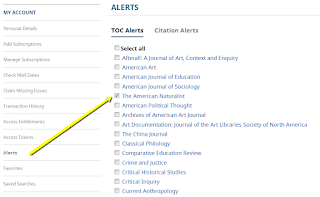 At the bottom of the TOC Alerts tab, there is the option for getting an email whenever an article posts on the Ahead of Print page. The options of Never, Daily, Weekly, or Monthly (though, since Am Nat *is* a monthly, that's not too helpful). 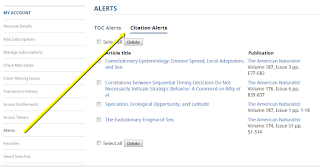 Citation Alerts are on the second tab under Alerts. 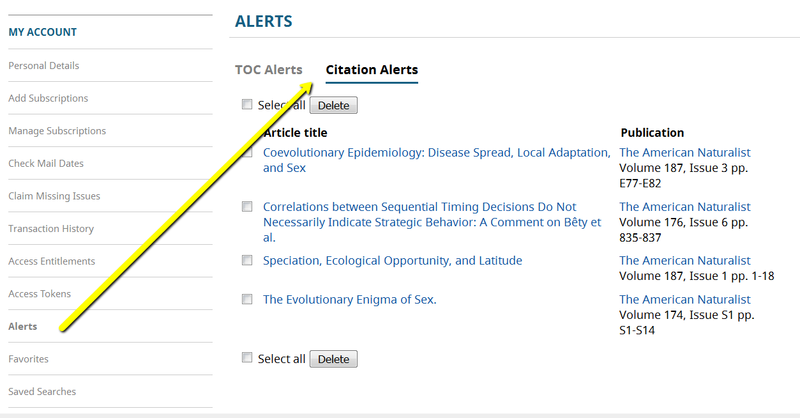 This tab allows you to delete existing citation alerts or check on which articles you have set up. 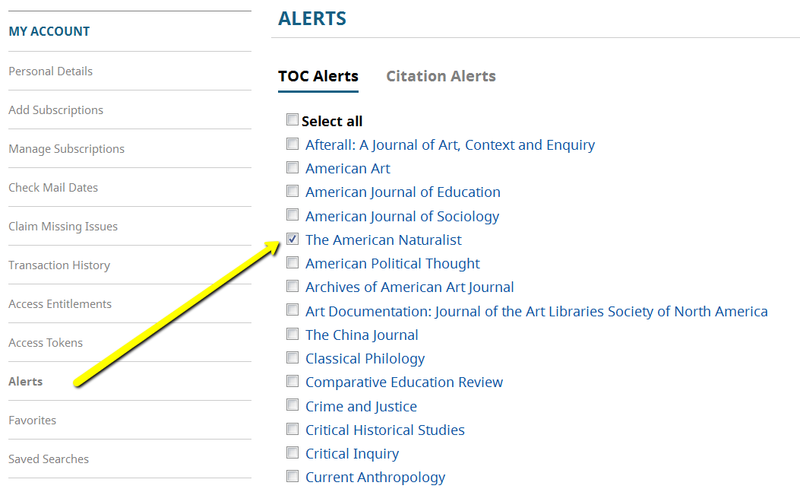 To set up a new citation alert, you click on the link at the top of the article you are reading. 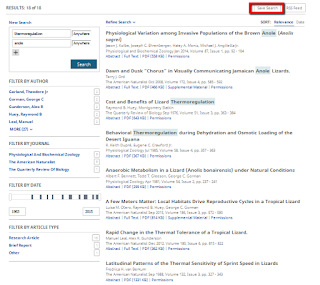 Saved Searches allows you to keep a focused eye on topics of interest in the journal. 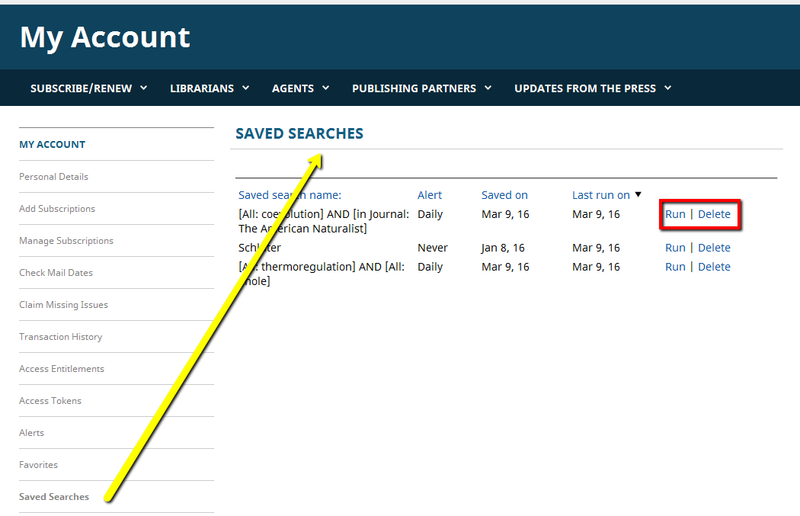 After a specific search (filtered by keywords, authors, time frame), save the search by clicking on the button. 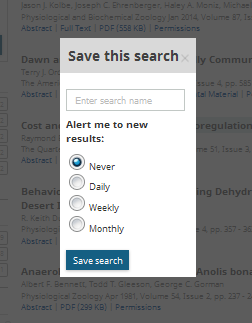 From the My Account page for Saved Searches, you can change the alert setting frequency or run the whole search over again and get all the available results.